Are you looking to book a taxi from Stansted? If yes, then you’ve come to the right place! We’re one of the coolest taxi companies at Stansted, with a great experience in transfers to and from the airport. We offer numerous services and fantastic customer support with communication over the entire process to make your journey a wonderful and stress free one. We like to offer our clients the best possible experience when they book with our company therefore you will be more than delighted when you will book a taxi from Stansted Airport with us. How can you book a taxi from Stansted with us? 1. You can go on this page: https://247stanstedairporttransfer.co.uk/get-price/ to get a quote for the transfer. Because we want to make it as simple as possible for you, you can pay by using one of the following: cash to the driver, credit card, bank transfer, Paypal or Google Wallet . Where will the driver meet you? Our meeting point at Stansted Airport is Cafe Modena for Domestic Arrivals and Costa Coffee for International Arrivals. We’re sure that it will be really easy to find your driver for your taxi from Stansted as the meeting points are right outside the Arrivals. You can easily recognize them as they are always elegantly dressed, smiling and holding a board or a tablet with our name on it. That’s fantastic! We’d also like you to know that we can provide you with any kind of taxi, from Saloon type to 8 Seaters. On request we can even send a coach for groups larger than 8 people. All you have to do is ask! Simple isn’t it? In the end we’d also like to ask you to check the confirmation e-mail you’ll receive after booking the taxi from Stansted. Although we’re sure that we’ve got your details correctly it’s best to take a look at them yourself. And that’s about all. We’d love to have you as our customer and we hope you feel the same! The 247 Stansted Airport Transfer team. 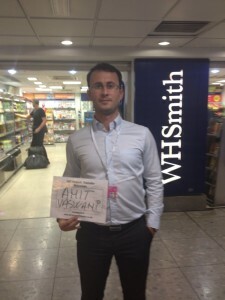 ‹ Stansted Taxis – Why book with us?